San Diego County is the home of twenty lakes that collectively provide year round fly angling opportunities for trout and warm water species. Fly fishing for largemouth bass, bluegill, black crappie, and carp is most productive March through October but but can be productive November through February under the right conditions. Many lakes are stocked with trout from November through March when water temperatures are cooler. The lakes receiving stocks and the schedules can vary from year to year depending on the budgets of California Fish and Game and the water districts that manage the lakes. Lake Cuyamaca, in the mountains roughly 60 miles east of the city of San Diego, is stocked with trout year round. While some lakes are open daily, many are open on limited three or four day a week schedules and some are closed for portions of the year. Most have a daily access fee. Many have boat rentals available. Float tubes and wading are allowed on some waters. Current hours and fees are listed on the lakes’ websites. The temperate weather conditions provide for a long growing season for the warm water species. 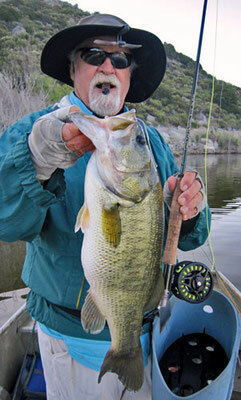 As of June 2011, 11 of the top 25 largemouth bass ever caught were taken in San Diego county waters as were several IGFA fly rod class tippet records. 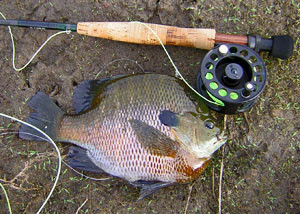 Bluegills in the ten to twelve inch range are common and examples weighing in at two pounds or greater are not unusual. 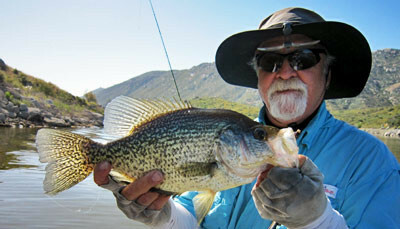 Black crappie 15-18 inches in length and weighing in at two to three pounds or more can be found in several lakes. Fly fishing for carp is gaining in popularity every year. Although an angler with a 5wt rod, floating line, and a handful of black size 10 woolly buggers will have all they need to catch all species much of the year, heavier or lighter gear and sinking lines may be better choices at times. For trout and carp, 4wt through 7wt fly rods are recommended with floating, sink tip, and intermediate lines sufficient to get to the fish in most conditions. Most fish will be taken with subsurface techniques with occasional surface action associated with chironomid hatches, springtime ant or terminate falls, and summer hopper hatches. For bluegill and crappie 0wt (“ought”) through 7wt rods outfitted with the lines used for trout are recommend, the heavier rods being useful when pursuing fish in thick cover. Largemouth bass anglers typically employ 5wt through 10wt rods with the heavier rods being useful for casting large streamers used to imitate stocked trout or large frog like bass bugs. The bass angler will use floating lines the majority of the time; however, the prepared angler will also have sink tip, intermediate, and fast sinking lines in their arsenal.